At least the United States extended two sets to tiebreakers today. So much for the Americans' highlights as host Croatia swept all six sets on outdoor clay to take a 2-0 lead in Zadar on the Adriatic Sea in the Davis Cup semifinals. Borna Coric defeated Steve Johnson 6-4, 7-6 (4), 6-3, and Marin Cilic beat Frances Tiafoe 6-1, 6-3, 7-6 (5). 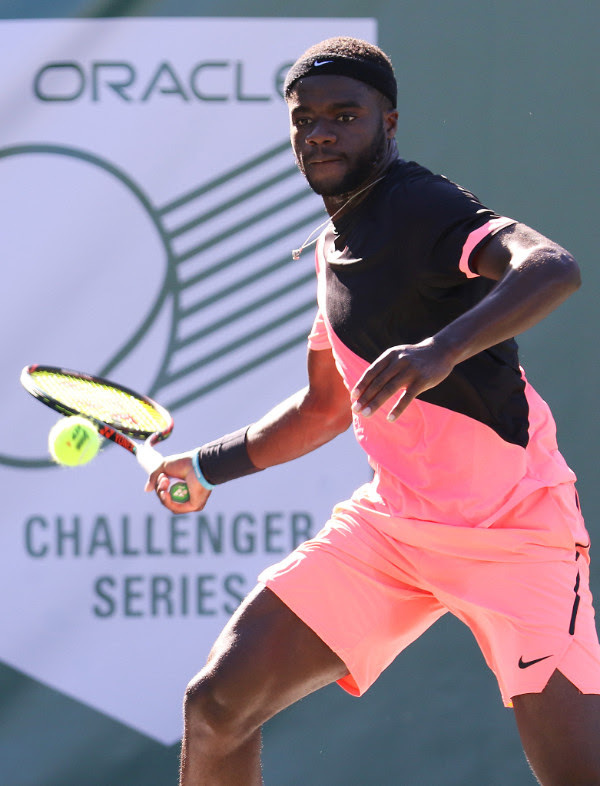 Tiafoe, who won the 2016 Stockton (Calif.) Challenger, was making his Davis Cup debut at 20. The United States must win Saturday's doubles match to stay alive in the best-of-five competition. Americans Mike Bryan (Stanford, 1997-98) and Ryan Harrison are scheduled to oppose Ivan Dodig and Mate Pavic. Bryan has captured a record 18 Grand Slam men's doubles titles, and the other three players have won one each. The United States has not reached the Davis Cup final since winning the 2007 crown in Portland, Ore. Croatia, the 2005 champion, is trying to reach the final for the second time in three years. --The nation, slightly smaller than West Virginia with a population (4.2 million) comparable to metropolitan Detroit, is 4-0 against the United States. In the most recent meeting, Croatia stunned the U.S. 3-2 after trailing 2-0 in Portland in the 2016 quarterfinals. --As the host, Croatia chose the United States' weakest surface. --Croatia has a formidable team. The 6-foot-6 (1.98-meter) Cilic, the 2014 U.S. Open champion and a two-time Grand Slam runner-up, is ranked No. 6 in singles. Coric, who upset Roger Federer to win the Halle (Germany) title on grass in June, is No. 18. Pavic and Dodig are No. 4 and No. 24, respectively, in doubles. --The United States is missing its top two players, not that they necessarily would have made a difference. Six-foot-10 (2.08-meter) John Isner, ranked No. 10, is at home in the United States awaiting the birth of his first child. Jack Sock, ranked No. 17 in singles and No. 2 in doubles, is out with a hip injury. Bryan and Sock have won the last two Grand Slam men's doubles titles. WTA tour -- Two ex-champions and one former runner-up in the Sacramento Challenger reached the semifinals in Quebec City or Hiroshima. No. 5 seed Sofia Kenin, a 19-year-old American, dismissed No. 3 Monica Puig 6-3, 6-1 in 55 minutes in Quebec City to reach her second WTA semifinal. Kenin has won Northern California Challengers in each of the past three years (Sacramento in 2016, Stockton last year and Berkeley in July). The Sacramento tournament lost its sponsor and moved to Berkeley this year. Puig claimed Puerto Rico's first Olympic gold medal in any sport in 2016 singles in Rio de Janeiro. Kenin, ranked No. 67, will play compatriot Jessica Pegula, a qualifier ranked No. 227 and the runner-up to Modesto product Maria Sanchez six years ago in the inaugural Sacramento Challenger. Pegula, the 24-year-old daughter of Buffalo Bills and Sabres owners Terrence and Kim Pegula, surprised No. 2 seed Petra Martic of Croatia 6-3, 7-5. Martic won last week's inaugural Chicago Challenger. In the doubles semifinals on Saturday, No. 3 seeds Desirae Krawczyk and Giuliana Olmos will play unseeded Asia Muhammad and Sanchez in an all-American matchup. Krawczyk and Olmos, from Fremont in the San Francisco Bay Area, won last year's Sacramento Challenger. Muhammad took the crown in Sacramento in 2012 with local product Yasmin Schnack, who retired the following year at 25, and in Berkeley in July with former Stanford star Nicole Gibbs. Amanda Anisimova, a 17-year-old U.S. qualifier, gained her first WTA semifinal with a 6-3, 6-1 victory over No. 2 seed Anna Schmiedlova of Slovakia in Hiroshima. The 134th-ranked Anisimova, who won her first professional title in the 2017 Sacramento Challenger, will face China's Zhang Shuai, seeded first and ranked No. 41.